For true airplane aficionados, here is the neatest model you have ever seen. This is the much LARGER size version of our LARGE Sopwith Camel, which has been a standout best seller so we will call it the MEGA Camel. It is only for those who can afford its price and MEGA SIZE! MSLP PRICE $799.00 PLUS $75.00 SHIPPING AND HANDLING TO 48 contiguous STATES. 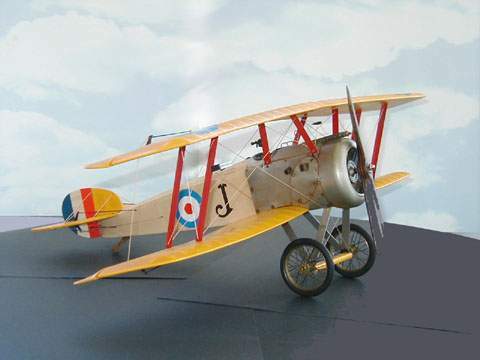 Presented is the latest addition to our superb collection of authentically detailed World War One aircraft models. The amount of time that is taken to recreate these "works of art" is measured in hundreds of hours, and yet the price is modest when compared to the mass produced die cast metal models which don't come close to capturing the feeling and atmosphere of the period. Designed and built in the same fashion as the original, with fabric stretched over ribs and frame, it is true to the real plane in all details with working control surfaces, i.e. ailerons, rudder and elevator. Even the spoked wheels have rubber tires, and leather rimmed cockpit and seat with miniature instruments are authentic to the period as is the detailed engine, laminated propeller, and historically correct colors. They bear no equal. Buy with confidence from people who know what they sell. Memberships include in part, Association of Naval Aviation, The Tailhook Association, Silver Wings, and former CO of McCampbell's Aces Squadron. APPROXIMATE MEGA DIMENSIONS: Wing Span 59 1/2" v. 29 1/2", Fuselage 39" v 19 3/4" v. 10", Height 19" v 9 1/2" WEIGHT: 12 lb v 3 1/2. HISTORY OF SOPWITH CAMEL: The First World War saw the advent of the airplane as a viable military weapon. In a period of only a few years, military aircraft advanced from rudimentary flying craft to killing machines. During this time, aerial superiority over the front changed hands as often as new designs were introduced. In 1916, the Germans controlled the skies over the trenches, and the English developed three fighters to regain control of the air war. 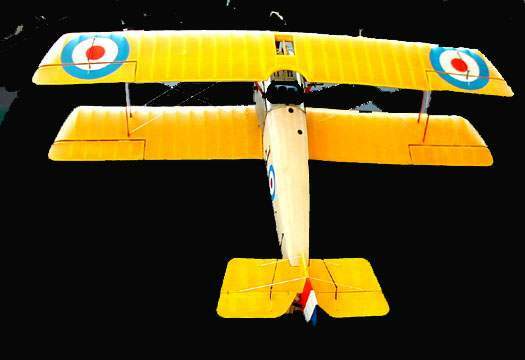 Rolled out by Sopwith in 1916, the best and most famous of these three designs was the Camel. Small and lightweight, the Camel represented the state-of the-art in fighter design at the time. The Sopwith Camel shot down 1,294 enemy aircraft during World War I, more than any other Allied fighter. However, it was so difficult to fly that more men lost their lives while learning to fly it than using it in combat. The Camel was a revolutionary machine in a number of respects. The plane's twin Vickers machine guns were mounted side by side in front of the cockpit -- a first for British fighters and a design feature that became standard on British fighters for nearly 20 years. Second, the pilot, engine, armament and controls were all crammed into a seven foot space at the front of the airplane. This helped give the plane its phenomenal performance, but it also made the plane very tricky to fly. Additionally, the plane's wood and fabric construction and lack of protection for the fuel tank made the Camel (like most W I aircraft) very susceptible to fire. Moreover, the poor state of pilot training during 1916-1917 meant that the average life expectancy of an English pilot was little more than two weeks. In service, the Camel proved to be a huge success, despite its high accident rate. Camels fought all along the Western Front as well as being employed as night fighters and balloon busters. Some the earliest fighters used by the Royal Navy were Camels which were deployed from cruisers, battleships and even towed platforms. Additionally, Camels fitted with eight primitive air-to-air rockets proved to be very effective against German Zeppelins and long-range bombers. The World War I flying ace Captain Arthur Roy Brown, a Canadian flying with the Royal Air Force. Captain Brown is credited by many with shooting down Baron von Richthofen (The Red Baron). ENGINE: Gnome 9 cylinder rotary 150h.p. MAX. TAKEOFF WEIGHT: 1,482 lbs. OUR UNCONDITIONAL GUARANTEE: If not completely satisfied with your purchase it may be returned, if without damage, within three days of receipt in its original condition and packaging. Returns must be insured for their full value. All that is required is a prior email authorization by us for the return. Shipping, packaging and handling is refundable within the United States if we are at fault.